My greatest fulfillment has always come from working directly with patients in my practice. But in recent years I've taken a sabbatical from seeing patients in order to pursue my goal of educating the public through writing and patient advocacy. During that time I heard from many of you wanting to know if I was available for private consultation. Having just finished my fourth book in as many years, I'm happy to announce that I've decided to once again return to seeing patients for a few hours each week. As of today, I am available for consultations both in person and by phone. Review your medical records and lab test results. Thoroughly discuss with you the experiences you've had with this illness. Determine what is likely causing your CFS or fibromyalgia (or fatigue or pain). Review my findings with you, in detail, and answer all of your questions. Design a detailed treatment protocol specific to your case. Prescribe and then monitor your treatment progress. If you already have a treating physician and simply want to speak with me to discuss your case and ask me questions, I'm happy to provide one-hour phone consultations as well. Q. Do I have to travel to Hawaii in person for the consultation? No. As long as you have a physician who has examined you to rule out other causes of your symptoms and you can supply those records, and as long as you continue to see your local physician yearly, I can prescribe the treatments needed for your CFS and fibromyalgia. Q. 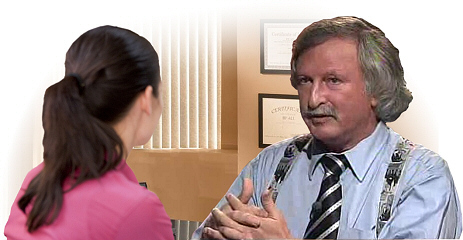 Can you prescribe without first doing a "new patient" consultation? No. Although I can make recommendations for you and your physician following a one-hour phone consultation, I would need to have performed a complete initial evaluation before I could prescribe medications. Q. If I was your patient in the past, do I still need a "new patient" consultation before you can treat me? If you've already seen me in the past, then I consider the "new patient" consultation complete and you do not have to repeat it. Depending on how long ago I last saw you, I may or may not still have your old records. Q. Is Cheryl Alberto still offering her consultation services? Yes. Cheryl (our office educator) is available at $95 per hour to help guide you on day-to-day care and answer your questions. Using her services can markedly cut down the time I need to spend on follow-up consultations with you and can certainly help reduce the overall fees from us. Q. Do you consult with people outside the U.S.? Yes. I consult with patients worldwide. If you'd like to learn more about one-on-one consulting with me, please contact our office assistant, Sarah, by email at appointments@endfatigue.com or by phone at 410-573-5389. When leaving a message, please include your name and phone number so that we can return your call.